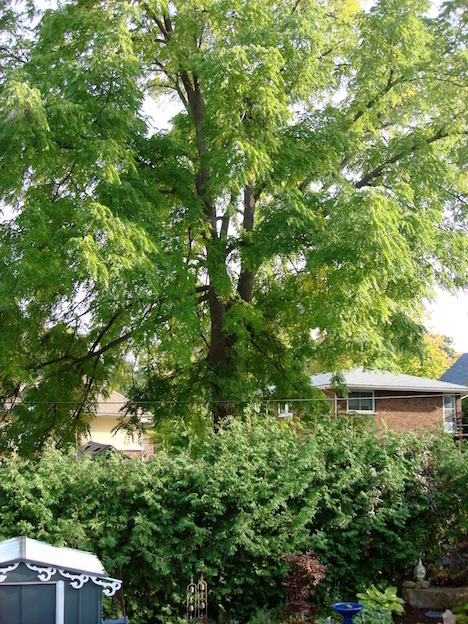 This Black Walnut tree overshadows my garden: it is gorgeous, graceful, huge and quite beautiful and... quite cranky…and lives in my neighbours yard. It is about 4 times the height of the two story house beneath it. Almost all Walnut trees are cranky... they don’t want neighbouring plants using up their nutrients so they give off some rather severe warnings in the form of toxins that I will explain in a bit. But first, look how lovely this tree is….however….. I had no idea this glorious specimen would be the most challenging "dragon" in this garden. Just so you know: all walnut trees, their roots, their nuts and leaves, give off a toxin called “juglone” which has been shown to be a “respiratory inhibitor” which deprives sensitive plants of needed energy to enable metabolic activity. Research states that plants may be slower to grow over time before there are any real signs that the toxins affect the plants. 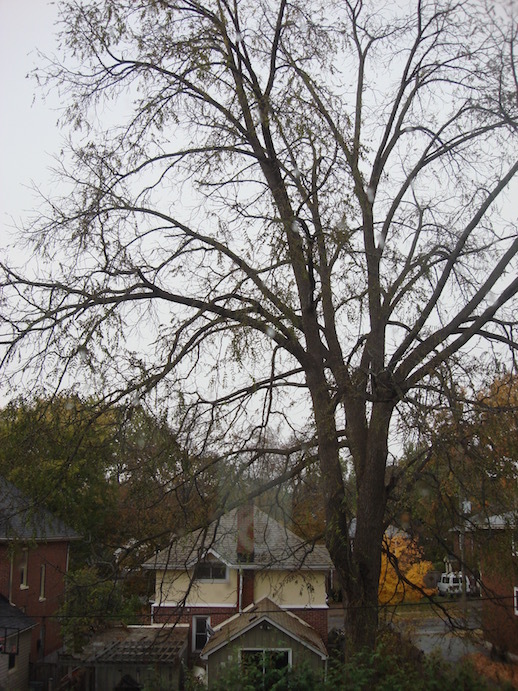 Walnut trees need to be anywhere from 12 to 25 years old before the juglone they release creates any noticeable effects but there are some plants that may not show any signs for some time. 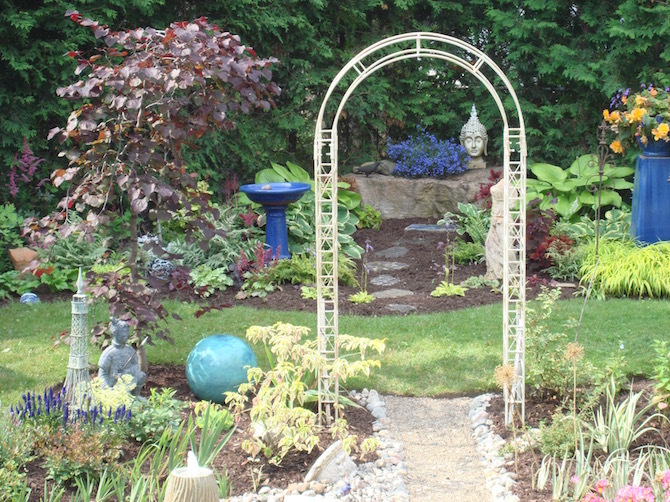 But what does all this really mean to your garden? ... the apple trees I planted near this magnificent tree the first year, did not do well… but that is an understatement. 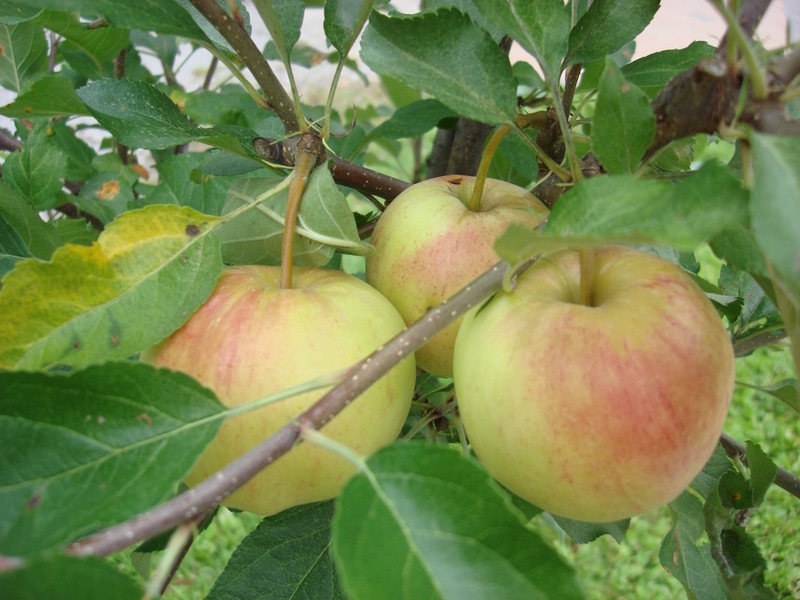 I was beginning to research the tree’s issues when I found that apples, tomatoes along with many others, will be poisoned by the toxin. I moved the trees away from the back garden and they are doing well with apples this year... someone took them, but I did have one... yum. Also in my first year in that garden, I planted gorgeous ‘Endless Summer’ Hydrangeas… my vision was to have a hedge of them in front of the cedar hedge.. to compliment my artsy, blue garden things. Within a few weeks of planting, their leaves turned almost yellow… I dug them up. washed the roots and replanted them a good 30 feet from the drip-line and roots. And, two years later, they have finally decided to bloom. The other annoying thing about Black Walnut leaves and nuts is the stain they leave on vehicles, walkways and such… one of the chemicals in juglone makes it a good stain for dying and leather tanning. If you have horses, be careful there is no black walnut wood in their bedding; they can become susceptible to Laminitis ….which has awful effects on their hooves. It has been a challenge to find plants for my garden that will tolerate juglone. There are many web sites that show lists of plants that will supposedly tolerate juglone - and yes, I am using that word to indicate that no matter what anyone tells you…. plants will only “tolerate” the toxin, not thrive in it. 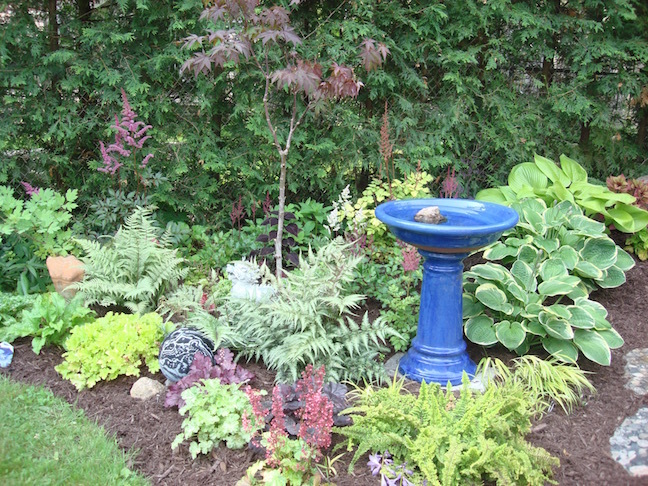 I have had some success with these plants in my garden under the Black Walnut: Hosta, Ferns, Heuchera (Coral Bells), Astilbe and this year, the annual, Coleus. Here is what it looked like this summer. Here is the new Redbud, and a small Pagoda Dogwood. These are all close to the drip-line of the Black Walnut but doing well so far. 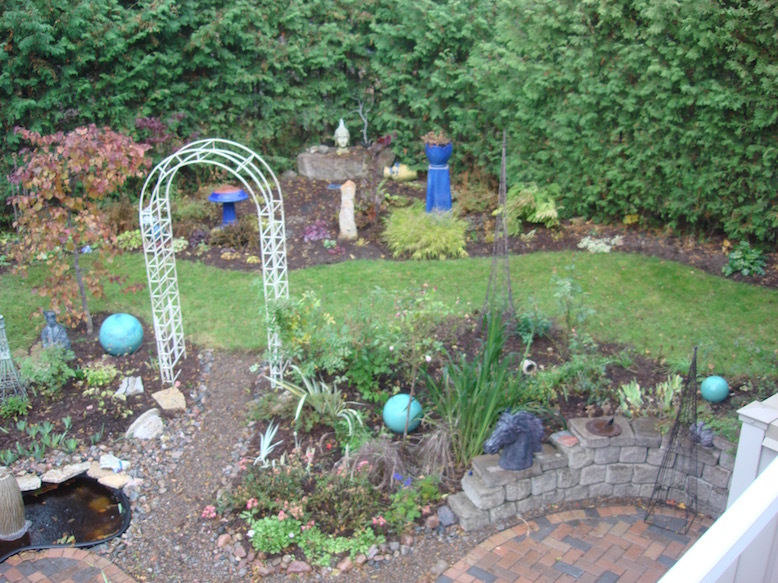 this page is to warn you what to do when the leaves fall on your garden. For some reason, this year especially, a fierce wind the other day blew most of them on my back bed we call “The Black Forty”… for obvious reasons. The toxin, Juglone, in the leaves will leach into the garden as the fall rains, and then snow wet them, and bind them to the soil. All winter, those toxins will be seeping into the garden soil, making it difficult for the plants to grow as they will spend energy battling the toxin. 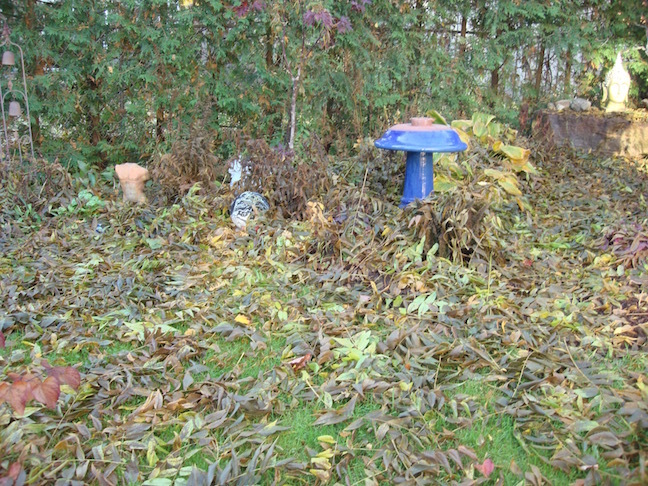 Even though a study revealed that the juglone concentrations were higher in the lower leaves than at the crown, nature does not divide the falling leaves into separate piles; they all fall in a mixed-up heap. 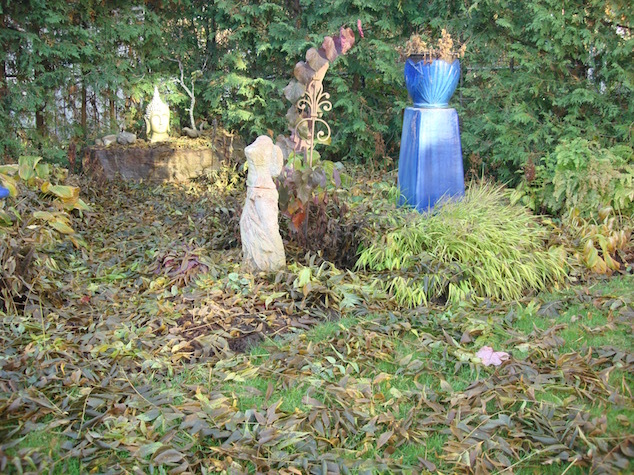 I have now raked all the fallen leaves from that bed and the grass around (see photo below). Another study suggests that a build-up of toxicity can be lessened if the soil is well drained, there is added compost, a presence of oxygen and ...if there are decomposing organisms. 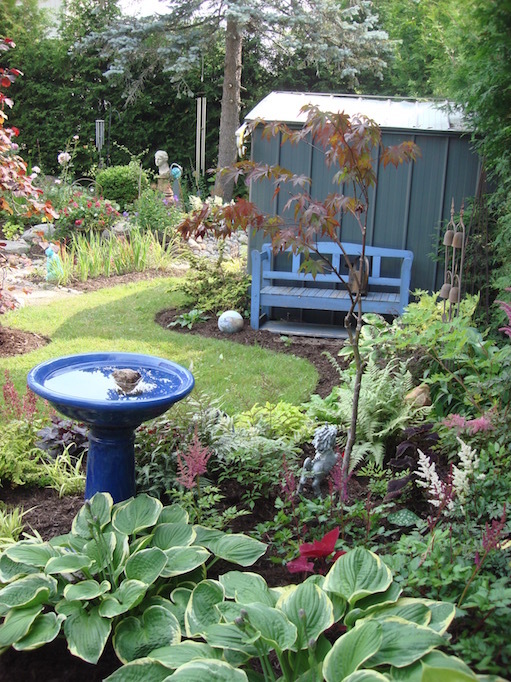 So, this fall, once again, we will add compost over the whole garden mixed with a volcanic mineral (carbonatite) -see www.borealagromimerals.com - for more detail... that will encourage microbial activity and maybe this magnificent tree will realize that it can live in harmony with my garden.